via Bangkok Post, 25 Feb 2018: Phimai is a 12th century Angkorian temple located in Northeast Thailand. NAKHON RATCHASIMA: Residents in Tambon Phimai Municipality of Phimai district have raised an objection to the Fine Arts Department’s move to declare a 2,658-rai area a historic site, saying that they have lived in the area for generations, and have proper legal documents to prove their right to occupy the land. The Bangkok Post has a video story on the Phimai Historical Park, a Khmer temple in Northeast Thailand. The cost of repair to historic and archaeological sites from damage caused by the recent floods in Thailand are set to hit 600 million Thai Baht, or approximately USD$20 million. 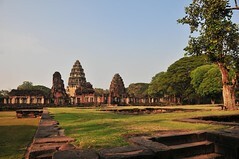 Among the 200 sites affected are the Phimai Historical Park and the Ban Prasat Archaeological site.